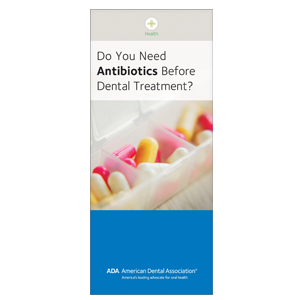 Updated to address people who have been taking antibiotics but no longer need them, this brochure clarifies who should take antibiotics before dental treatment and who should not. Taking into account the current AHA recommendations, it also discusses antibiotic prophylaxis for patients with orthopedic implants. Asks patients to consider the downsides of antibiotics as well as possible benefits. Encourages patients with questions to discuss antibiotics with their dentist and physician. 6-panel brochure, pack of 50.